Here’s the trailer from the forthcoming DJ Dusk’s Root Down Soundclash DVD, set for retail stores via Mochilla on January 13. (Some online stores are already selling it.) The battles, which took place between 2001-2003, feature Madlib vs. Cut Chemist, Will.i.am vs. Thes One (from People Under the Stairs) and Oh No vs. Exile, all hosted by the late Tarek “DJ Dusk” Captan. 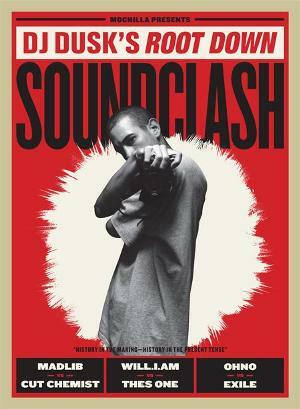 In 2001 Los Angeles club, The Root Down put on their first of a three part series called “Sound Clash”. It featured Madlib and Cut Chemist going head to head, beat for beat for respect in front of a packed club. Each of the tracks had never been released. Each of the three rounds saw the excitement rise. The last round unleashed a partisan celebration from the captivated crowd. It was a beautiful underground hip hop moment. This entry was posted in News and tagged DJ Dusk, Mochilla. Bookmark the permalink.